German artist Carl Grossberg’s Marktbreit (1931) is featured in a new two-part installation of works on loan from the Merrill C. Berman Collection. 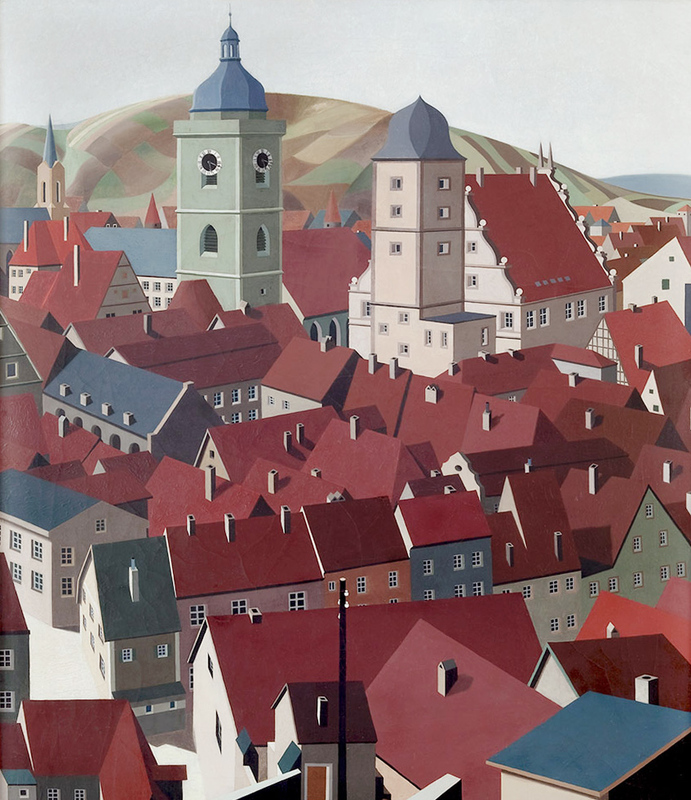 At first glance, Carl Grossberg’s Marktbreit seems to offer a serene, photorealistic view of a Bavarian village. Real-life landmarks—the bell tower of St. Nikolai and the ornate facade of Marktbreit Palace—stand out against the pitched roofs and jutting chimneys. But all is not quite as it seems. A viewer might pick up on other unusual details in the painting, such as the central placement of an electrical pole and the conspicuous absence of people; the pole is an unexpectedly modern element in a landscape from an earlier century. Those aspects of the work demonstrate Grossberg’s unique stance within the German art of Neue Sachlichkeit, or New Objectivity, whose artists shared a renewed engagement with realism. While Grossberg’s verisimilitude, attention to detail, and high degree of finish aligned him with this interwar style, he combined this approach with less conventional techniques, including turns of surrealism, as with the electrical pole in Marktbreit. A temporary two-part installation—the first of which is on view now—offers a glimpse into Grossberg’s world, and for most visitors, an introduction to the artist. Grossberg was a successful painter and interior designer in Germany during his short lifetime (he died in 1940, at the age of 46), but his art was kept in the family until recently. 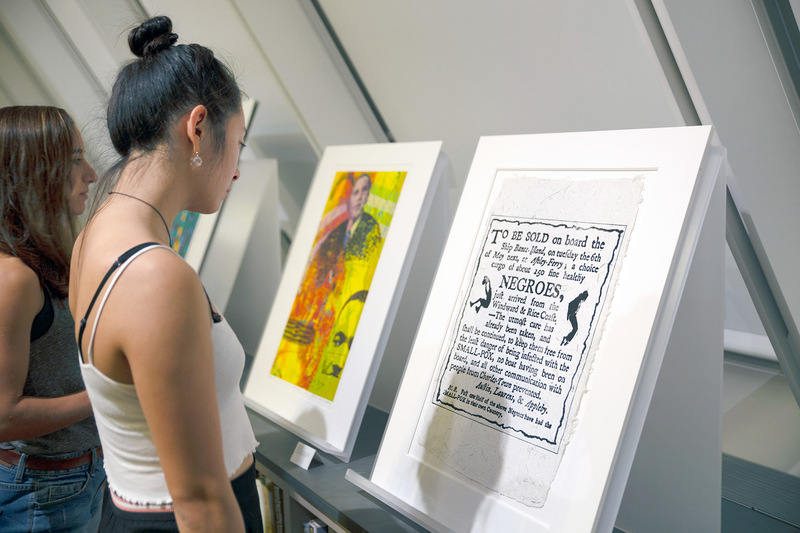 The installation is the first monographic presentation of Grossberg’s paintings, drawings, and lithographs in the United States, and is made possible through generous loans from the Merrill C. Berman Collection. 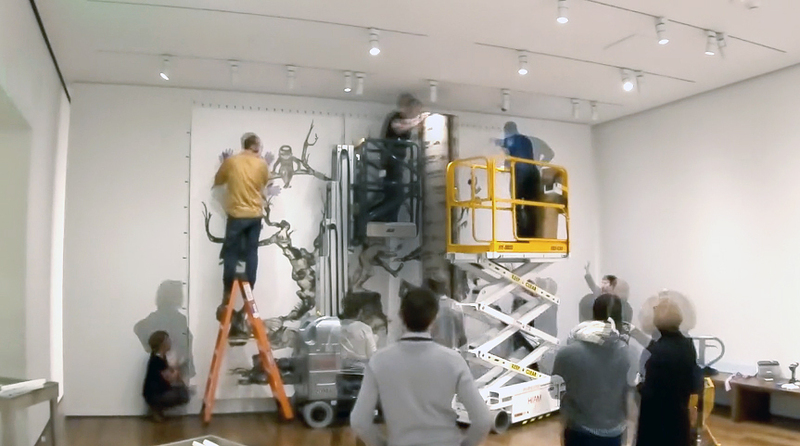 The second installation will go on view in December. Berman, Harvard Class of 1960, began to collect Grossberg after works were released on the market in the early 2000s. He estimates that he owns nearly 20 works by Grossberg, which complement his extensive collection of avant-garde graphic design and modern German art. Carl Grossberg, Composition with Turbine, 1929. Oil on wood. Collection of Merrill C. Berman, Q48.12. The Grossberg installation marks the second time that works from Berman’s collection have been shown at the Harvard Art Museums; in 2016, a two-part installation focused on “The Ring,” an international graphic design group of a dozen artists, architects, and designers. Like that installation, this latest one will appeal to those interested in German art and design of the early 20th century. Like many artists of his era, Grossberg’s life and career were punctuated by war. Born in Elberfeld, Germany, in 1894, Grossberg was an architecture student when he was drafted into World War I. Upon reentering civilian life, he studied painting with Lyonel Feininger at the Bauhaus and led a successful career in the 1930s as both an artist and an interior designer. Grossberg quickly became known as a specialist in architectural and industrial subjects. 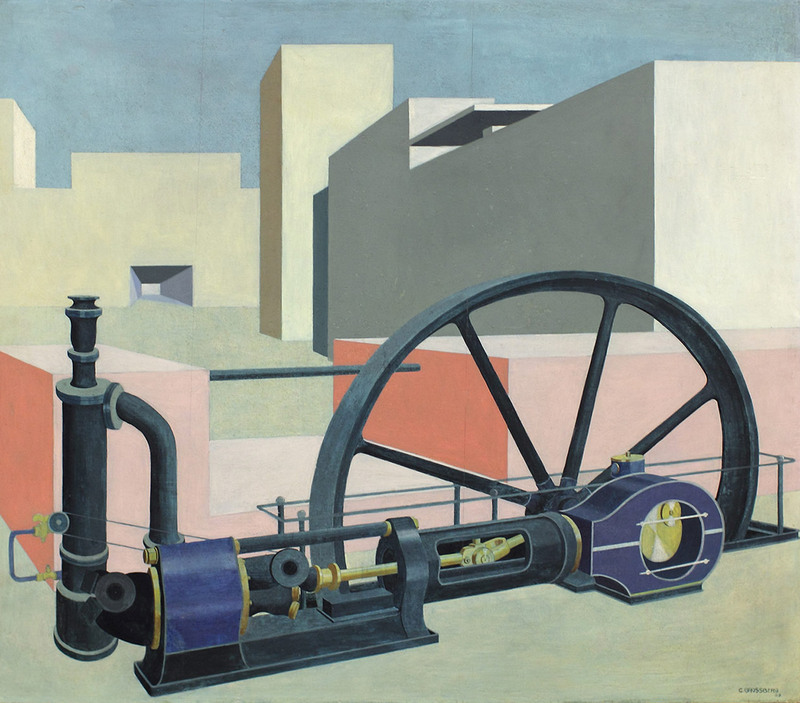 He was fascinated with machinery, evidenced by the engines, storage tanks, and turbines in his machine portraits, such as Coffee Roaster (1933), Machine Hall (1931), and Textile Factory (1935). Each depicts factory equipment in meticulous detail—and in clean and gleaming idealized spaces without the workers who ran them or the chaos of operation. of Carl Grossberg, Coffee Roaster, 1933. Graphite on paper. Collection of Merrill C. Berman, TL41741.7. of Carl Grossberg, Textile Factory, 1935. Oil on wood. Collection of Merrill C. Berman, TL41741.12. of Carl Grossberg, Machine Hall, 1931. Lithograph on paper. Collection of Merrill C. Berman, TL41741.10. Revealing another glimpse into the era, the painting Berlin, AVUS (1928) takes as its subject the gatehouse to Germany’s first controlled-access highway, called “Automobile Access and Training Road,” or “AVUS.” When it wasn’t hosting races, the highway operated as a toll road and connected the Berlin neighborhood of Charlottenburg to nearby Potsdam. Today’s viewers of the painting will recognize signs advertising Mercedes-Benz and Fiat. 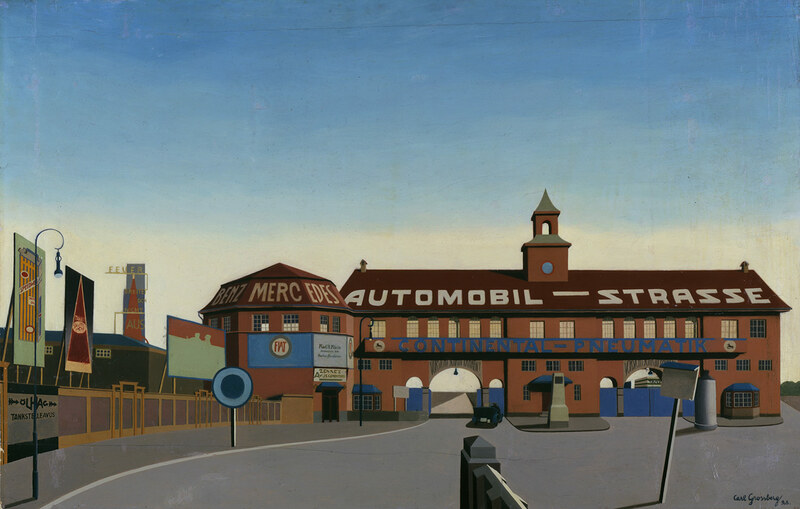 Carl Grossberg, Berlin, AVUS, 1928. Oil on wood. Collection of Merrill C. Berman, TL41741.1. The subject of Interior (1935) may also be familiar to modern viewers. Depicting a model room of the sort Grossberg would have created in his career as an interior designer, the painting features tubular steel chairs just like those designed by Marcel Breuer at the Bauhaus in 1925—and like many still used in homes and businesses today. To underline Grossberg’s connection with the Bauhaus, a strength of the Busch-Reisinger collection (and the focus of a robust new Special Collection), an example of Breuer’s Club Chair (B3) is displayed beneath Interior. Carl Grossberg, Interior, 1935. Oil on plywood. Collection of Merrill C. Berman, TL41741.5. 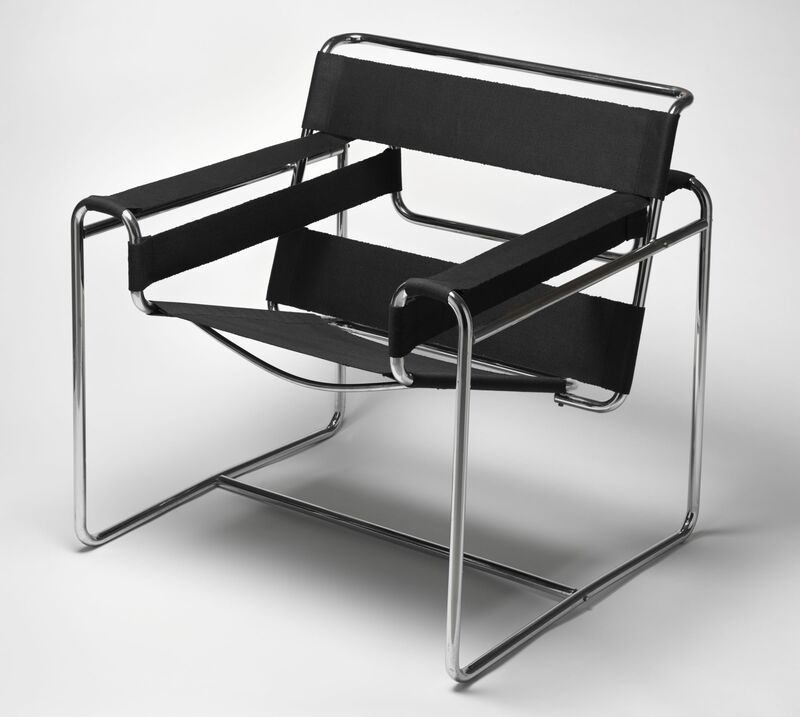 Marcel Breuer, Club Chair (B3), designed 1925, manufactured 1929–32. Nickel-plated steel tubing and modern canvas. Harvard Art Museums/Busch-Reisinger Museum, Anonymous gift, BR48.27. 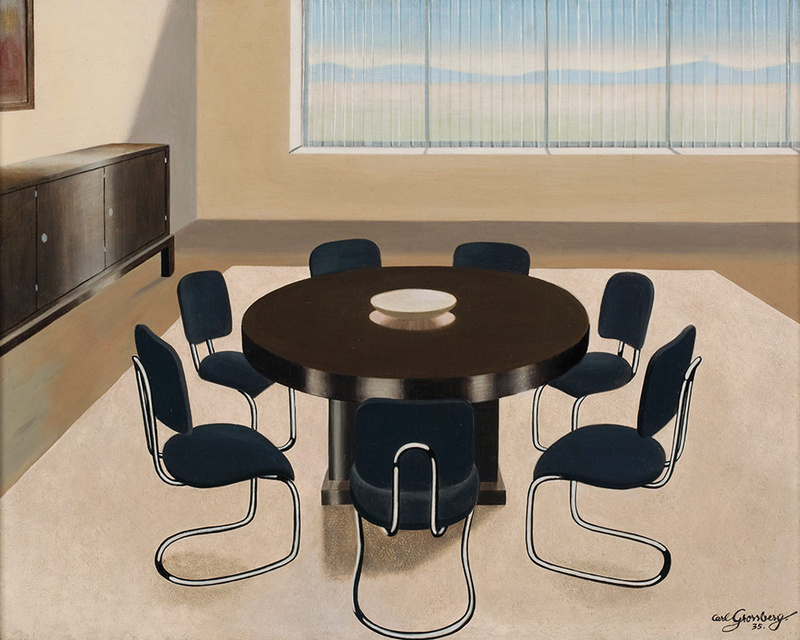 As with much of Grossberg’s art, Interior contains unsettling or illogical details: upon closer examination, the table casts a shadow, but the chairs do not; the empty fruit bowl adds a sense of unease; and the view through the window looks patently fake. It’s yet another work that signals the artist’s affinity with surrealists, such as Max Ernst, whose Heavenly and Earthly Love hangs in a neighboring gallery.